Find and Book a Colorado Elk Hunting Trip with a Professional, Pre-Screened Colorado Hunting Guide / Outfitter. Elk (Cervus elaphus). 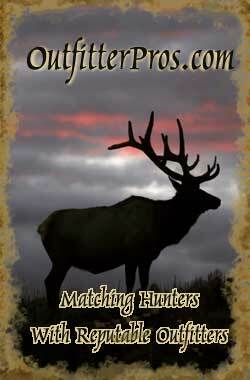 OutfitterPros.com features 35 Elk hunts with 18 professional Colorado hunting guides and outfitters. All outfitters are licensed, insured, and have passed our exclusive 5 point rating system. These are dream Elk hunts in Colorado with some of the best Elk hunting outfitters and Elk hunting guides in the world! Choose from 10 Colorado ranches for Elk Hunting and Deer Hunting in hunting units 15,25,42,65,70,and 78. Hunting leases border White River, Routt and San Isbal National Forest. Completely furnished cabins and lodges on most leases. Maximum of 4-8 Deer and Elk hunters per lease, only one group per lease. I began Deer Hunting and Elk Hunting in Colorado over 25 years ago. We find the do-it-yourself non-guided hunt on private property to be most fulfilling and productive hunting experience available. Our company and the landowners have designated a low number of Deer and Elk hunters (4-8) per season on each lease to guarantee a non-crowded, highly productive Elk and Deer hunting environment. Our leases offer a wide selection of accommodations. We have leases with cabins, camping availability or if you wish a motel stay in the nearest town. The use of ATV's is permitted and encouraged on all our Deer and Elk hunting leases.